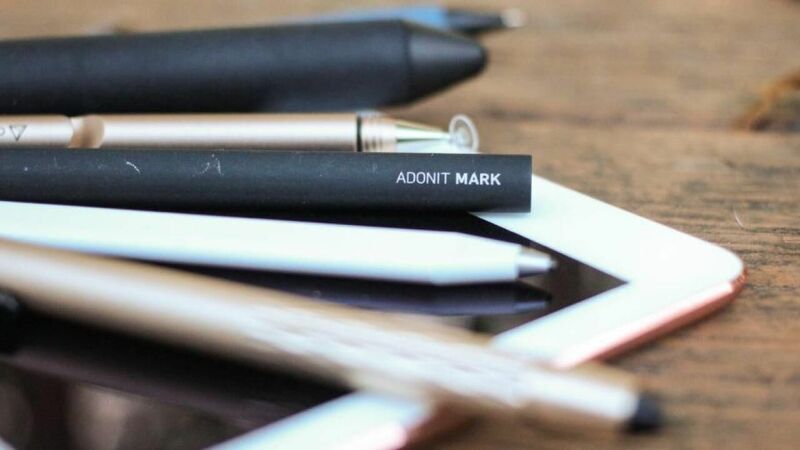 Apple’s first non-Pro tablet device attributed with Pencil support might be replaced by a new model this Spring. Nevertheless, while waiting for its successor, digitalEPIGRAPHY would like to put last year’s model under the microscope and see if the cheapest solution would still be good enough for our digital drawing requirements. Obviously, the main selling point for this particular iPad is support for the Apple Pencil, which can be especially exciting for our colleagues with smaller budgets. The regular iPad starts at $329 (32GB Wi-Fi only) when purchased through Apple, but is often discounted at retailers. Some models currently sold for $279 at Amazon, which makes it half the price of the iPad Pro 10.5-inch ($649 for 64GB Wi-Fi only). 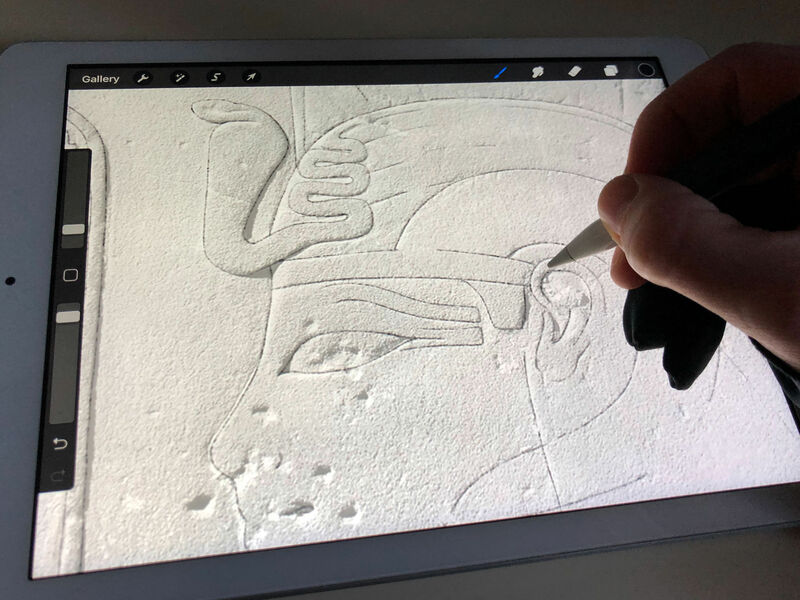 We’ve already praised last year’s iPad Pro 10.5-inch for its versatility and speed, finding it a reasonable compromise for digital field epigraphy. Now let’s see if the regular iPad has what it takes to become our everyday drawing tablet. We would like to get it out of the way immediately and tell you what is missing when compared with the Pro models, starting with the most important component, the screen: the regular iPad lacks the laminated, DCI-P3 wide color gamut, 120 Hz ProMotion, color-matching TrueTone display of the iPad Pro. Although less of a loss for digital epigraphy, but it also lacks the quad-speaker system for landscape stereo. It lacks the 4 GB of RAM necessary for simultaneous side-by-side and slide-over apps, however, the small screen is not ideal for this type of multitasking anyway. There is no Smart Connector for the Apple Smart Keyboard, but the iPad supports all Bluetooth keyboards that you’re used to. Another, more relevant omission is the 12 mp /4K rear camera and 7 mp /1080p front camera, as we must make do with an 8 mp camera that hasn’t been changed since the iPad Air. And of course, there are no larger 10.5-inch and 12.9-inch screen options, only the same old 9.7-inch screen real estate to draw on. The iPad’s screen is extremely reflective; therefore, it is advised to apply a matte screen protector. Having a screen protector on removes the reflection and provides a much more fluent, tactile drawing experience when using the Apple Pencil. The IPS display uses 2,048 × 1,536 resolution which makes everything look sharp. However, it lacks the laminated display of the iPad Pro, which makes it look less like the pixels are painted under the screen and more like they're embedded into the glass. Colors are restricted to the sRGB space rather than the wider gamut DCI-P3, so you don't get the deeper reds and richer greens which might affect your work when you produce color drawings. There's no TrueTone, so white doesn't always look natural under certain light conditions. The most hurtful omission is of ProMotion, the technology that boosts the refresh rate to 120 Hz, not only making scrolling smoother but making Pencil latency non-noticeable. 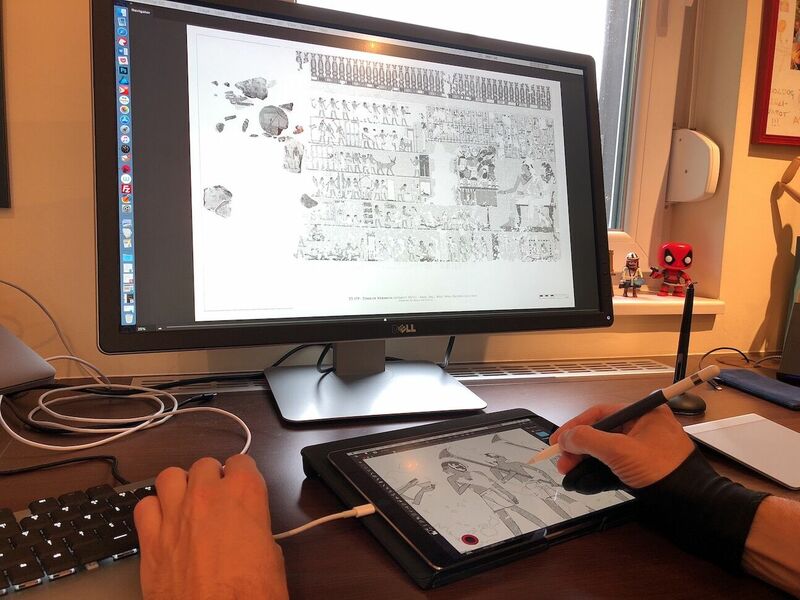 With that said, some of these compromises can be soaring if you work with complex drawings, but most of these features you’ll be able to live without if your work only concerns digital penciling and some studio inking. Regarding speed, we have good news. The recent model is faster than any other iPad before, with the A10 Fusion chip being about 1.5x as fast as the Apple A9 in the 2017 model. Combined with a hex-core graphics processor, it provides plenty of power for launching apps or photos and it doesn’t chuckle when moving large PSD files in and out of Procreate. However, it is a little slower to move around on; files do take a little longer to duplicate or open from the photo gallery, but we’re talking about seconds and not minutes. The only real limitation of the lower-powered chip and less of a graphic memory occurs when setting up layers in Procreate, because it puts limits on the number of layers that you can create at any given size in order to stop the app from crashing. 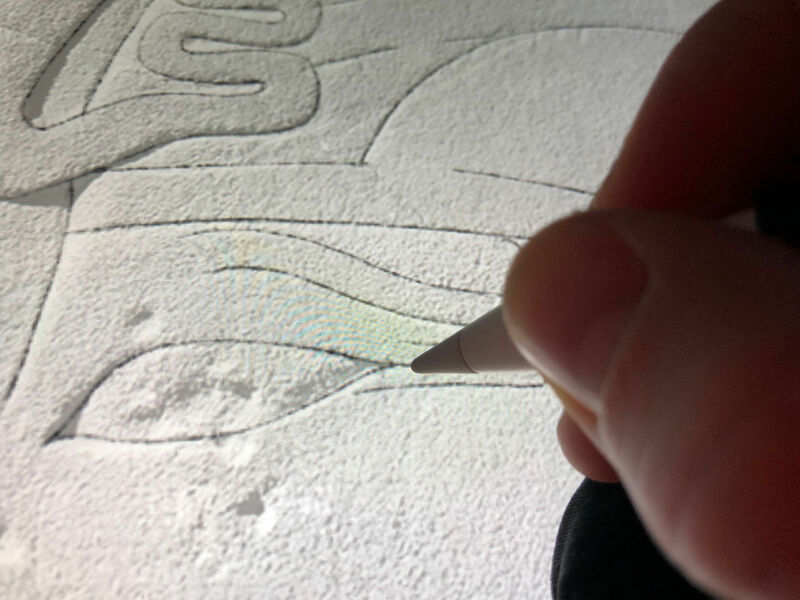 In our own experience, although the 2018 iPad had no problem creating as many layers at A4 and A3 size at 300dpi as our 12.9-inch iPad Pro, it refused to add the necessary amount of layers to our LD 177 test scene. As we stated at the beginning, the real attraction of the current generation iPad is support for the Apple Pencil. Introduced alongside the original iPad Pro, Apple’s stylus combines pressure sensors in the tip with telemetry sensors and a rechargeable lithium-ion battery. To support the Pencil, the iPad has the same touch system as the iPad Pro. Unfortunately, the air gap of the non-laminated display initiates less of a great drawing experience as the original Pros, and even more so in comparison with the current versions. All and all, the experience of drawing on the iPad is not too bad and is something we would still consider satisfactory. 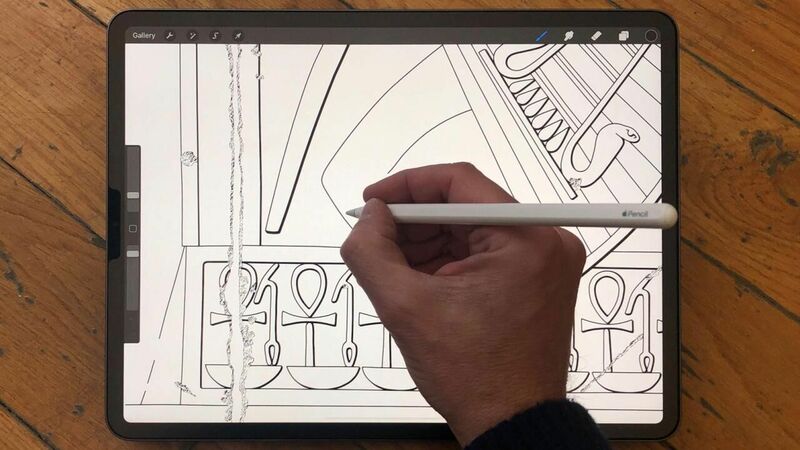 One thing to keep in mind though: the air gap produces a hollow sound when the surface is being tapped on, which may be off-putting for those coming from the iPad Pro, which produces a more dampened sound when used with the Pencil. Weird sound aside, we didn’t notice any difference from drawing on the iPad Pro. Palm rejection using Procreate and Astropad is almost flawless, tilt sensitivity is supported whenever needed and the tilt responds well to pressure as well. As we conclude our review, we want to say it out loud: the iPad (6thGen. 2018) is the best portable drawing tablet at the current price point, unless your work demands a larger display. Penciling in Procreate on the 9.7-inch display is still very satisfactory as you can use nearly the entire screen as your canvas. Obviously, the iPad Pro is better, but way more expensive and the drawing experience is so similar despite the lack of many features, that it may not be justified for many of us to spend the extra hundreds of dollars to get the Pro experience. However, because of the small screen real estate, it may be a tough sell as your main studio tablet, unless you already own an external monitor to outsource some of your workflow to a bigger screen. The iPad may have only half the features of the iPad Pro, but it is very nearly half the price at $329. If you don't need those extra features for your documentation work, it can be a significant saving over the Pro, even with the Apple Pencil ($99) thrown in your bag. 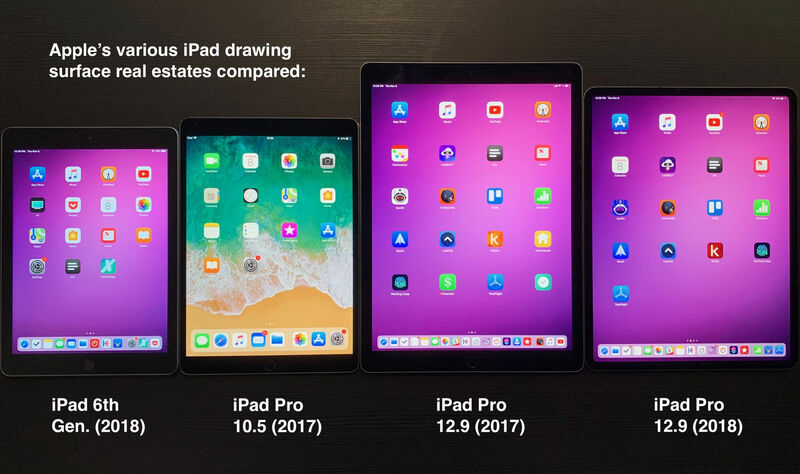 And with the 7thgeneration iPad just around the corner (rumored to be slated for a late March release), soon we'll have even more affordable options to choose from regarding Apple's tablets.